Two Darwen brothers will be braving the cold – wearing their shorts for school throughout winter in memory of their late mum. Tom Mayoh, 10, and Jack, 8, hope to raise £1,000 for East Lancashire Hospice, who cared for their mum Louise before she passed away aged 39 in July this year. The boys, who attend St Barnabas School in Darwen, came up with the idea after a joke from their dad Gareth. And today (Tuesday 13 November) they have been filmed by ITV's very own Paul Crone for tonight's 6pm Granada Reports Bulletin. Gareth said: “Louise was a great mum. Each morning in the summer she would alternate between long trousers and shorts in the summer depending on the weather. When Louise died, to help me the boys just wore their shorts. We only realised the other day that they have gone the whole summer in their shorts - and we joked that they might as well wear them all winter too. Louise, who was just 39, was cared for in the final weeks of her life at East Lancashire Hospice. She was diagnosed with breast cancer three years ago after finding a lump. Despite a mastectomy, chemotherapy and radiotherapy the cancer spread to her bones. 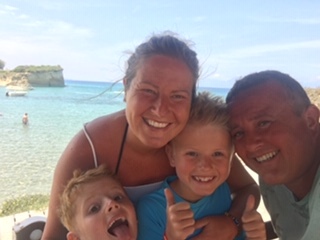 Tom and Jack didn’t know about her illness until she contracted pneumonia and the family were told by doctors that there was nothing else they could do. Dad said: “Louise didn’t want the boy’s childhood to be all about the cancer. I think they’re going to find it more difficult than they realise but what they’re doing for the hospice is fantastic. The boys have continued to visit the hospice since her death, making memory boxes for the hand casts they made with their mum before she died. The boys have set themselves a target of £1,000 on their Just Giving page. The brothers are also planning a stall at their school’s Christmas fair – and some of their friends have said they might join in the challenge.